I feel like I've been waiting forever for a new book from Heather Dixon. I so adored her first novel, Entwined, a retelling of the Twelve Dancing Princesses story. Now, four years later, we have a new book. Illusionarium is set in an alternate nineteenth-century Britain, known as Arthurise. A deadly illness that only strikes down women is devastating the nation. Jonathan, a medical student, serves as an apprentice to his father, the country's second-best surgeon. Seeking his father's help, the king reunites Jonathan's father with his mentor, the renowned Lady Florel Knight, but she isn't what she seems. I started this book a few nights ago thinking, "I'll just read this for a few minutes." Famous last words, right? When I finally put it down and turned off the light, I was a quarter of the way through the book. I'd say Illusionarium was worth the wait. I love the richness of detail in this book. I can picture the setting laid out in all its steampunk glory--from the floating city of Fata Morgana, to the ruins of Nod'ol, the ghastly masks of its inhabitants, and the Illusionarium arena. 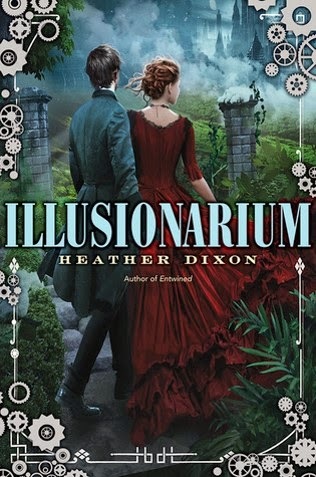 Illusionarium is a very visual book, which I'm certain can be connected to the fact that Heather Dixon is a visual artist (she's a storyboard artist for Disney Interactive) as well as an author. I've read several young adult books this year that feature a young man as the main character, and I've found them all quite refreshing. In some ways Jonathan is a stereotypical YA protagonist in that he thinks he's nothing special, but then he ends up with some incredible and rare ability. This trope can get old, and I've been known to sigh over it, but it didn't bother me in the slightest in Illusionarium because Jonathan is also genuine and not at all infallible. Also, I quite liked that family, rather than romance, is at the heart of this novel. Jonathan's relationship with Anna and his friendship with Lockwood were definitely high points. I'm really loving parallel realities right now, and Illusionarium combines the steampunk genre with the parallel reality set-up. And, in this case, two steampunk "Londons" are definitely better than one. I think I'd go so far to say that these alternate worlds share a connection to our own past. Lady Florel Knight must be linked to Florence Nightingale. Not only do they share similar names, but they both have the Crimean War and their medical professions in common. Illusionarium is a steampunk, parallel reality tale with a little bit of horror thrown into the mix. It's creepy, fascinating, and other-worldly but not without innocence and hope, as well. Cinder and Illusionarium: A devastating plague, a sick sister, and a desperate bargain to secure a cure. The Fog Diver and Illusionarium: High-altitude cities, floating airships, and danger on the ground. Illusions of Fate and Illusionarium: Besides the titles, both feature an alternate 19th-century Britain. Kiersten White's is called Albion. 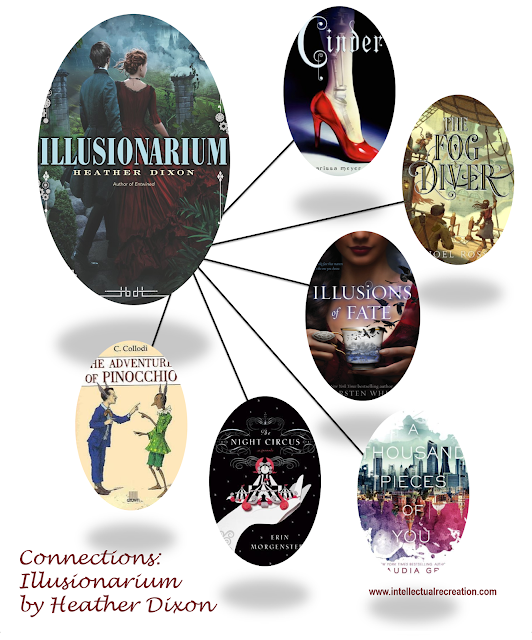 A Thousand Pieces of You and Illusionarium: In both books, the main characters hop between parallel realities where they meet other versions of their friends and family members. The Adventure of Pinocchio and Illusionarium: I see parallels between the Rivens and the donkeys in Collodi's classic tale. The more I think about this the more it rings true for me. It's always lovely when great first novel is followed by a great second novel. Illusionarium is out May 19th, 2015. Review copy from Edelweiss.